You may want a three-row SUV for its passenger carrying capabilities, but if it doesn't have the performance to match, it's not worth the purchase. The Dodge Durango is an attractive choice in the medium-sized SUV category because of its combination of space and power. The Durango's standard V6 engine offers impressive towing capacity and horsepower, but upgrading to the available SRT model will provide you with a best-in-class 8700 pound maximum tow limit plus 475 horsepower. Combine that with a choice of two all-wheel-drive systems, and the Durango offers drivers superior handling in addition to top-grade performance without sacrificing comfort or safety. 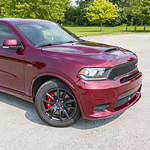 Interested in taking the 2018 Dodge Durango for a test drive? Come into Riverhead Chrysler Dodge Jeep Ram's showroom in Riverhead, NY today and let our sales team show you the finer points of this popular SUV!